Author Lee AasePosted on October 28, 2011 Categories Personal, PhilosophyTags Apple, AT&T, Enchantment, Guy Kawasaki, iPhone, iPhone 4S1 Comment on Under-promise. Over-deliver. It’s important not to write a blog post or Tweet in anger or frustration. Lots of people say you should count to 10 before you hit “publish” or send. I agree with this advice, and I took it in the case I’m about to share with you. In fact, in this case I counted to 10 DAYS! In talking with some colleagues yesterday, I experienced buyer’s remorse: not that I don’t want the iPhone, but that I think I would rather have the 64 GB so I can shoot more video. Me: Can I switch from 32 GB to 64 GB on my iPhone order? Tyrell XXXXX: Thank you for chatting in today Mr. Aase. I will be happy to assist you today with changing your order. May I have the last 4 of the account holder’s Social Security number? Tyrell XXXXX: I will be right with you. With that hopeful sign, and being at the 25 minute mark of my call, I decided to hang up. After all, Tyrell was going to help me change my order. Tyrell XXXXX: Is there anything else I can assist you with today? Me: I was just on hold with them for 25 minutes. I hung up because you were on chat. I thought this would help me get it done. Now it seems I have to call and wait on hold again. Tyrell XXXXX: I’m sorry for the delay. I’ll be right with you. Tyrell XXXXX: I apologize Mr. Aase. Is there anything else I can assist you with today? Tyrell XXXXX: Are you still with me Mr. Aase? Me: Well, now I’m back on hold where I had called previously. Nothing else needed. Thanks. Tyrell XXXXX: Remember you can always view and make changes to your account at att.com/mywireless. Why did he need to know the last four digits of my social security number to tell me that I had to call customer service to make the change? If I’m chatting after having logged in with my account, why would Tyrell need to further identify me to be able to tell me that he couldn’t help me? So I called the same number I had previously tried and held for another 20 minutes before someone who sounded suspiciously like “Peggy” answered. I explained my request to change an order that hadn’t shipped, and “Peggy” said that because my order was still “In Process” he couldn’t make any changes. I would need to wait until my phone arrived. That call took another 25 minutes, and still with no resolution. I was about to hit publish on this post on Oct. 12, but then I thought better of it. What if “In Process” means it is somewhere in the shipping pipeline? Maybe I would be getting my phone on the 15th or 17th, and things were just too far along for them to be able to stop it. So I just saved it as a draft. My colleague at work who ordered his iPhone upgrade from the Apple store received his on Oct. 14. I got an email Oct. 17 saying my order was still in process and would be delivered 14-21 days from the original order, which AT&T said was Oct. 10. I wasn’t going to quibble, even though I had an email dated Oct. 7 thanking me for my order. The note at the bottom said I should call an 800 number if I believe this happened in error, so I did. After a 37-minute call during which I briefly spoke with a young woman for whom English was clearly not her first language, but mostly was on hold listening to classical music, I was given an escalation number and told to expect a call back in 24 to 48 hours. She couldn’t tell me why my order would have been cancelled. So I went back to my account and reviewed my contact details and noticed that instead of my address reading 800 4th ST NW it just said 800 4th ST. It was missing the NW. I updated that and gave AT&T another call, thinking the incomplete address was the problem. This time I was told that since I already had an escalation number, I should wait for the call in 24 to 72 hours. The representative told me that since my order had been cancelled, I could order again. I responded that the AT&T site now said I wasn’t eligible for an upgrade, and asked if she could restore my eligibility. She did, and a couple of minutes later I checked my status and found that I now was eligible for an upgrade. So this time I ordered the 64GB version, which is what I had wanted 10 days ago. 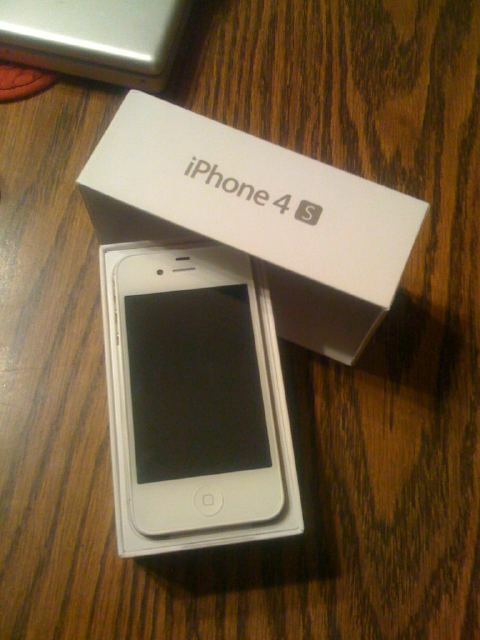 And instead of black, I ordered it in white. Would it really have been impossible to change my order 10 days ago to enable me to get the product I had decided I really wanted? AT&T could cancel it for some reason (I’m still not sure it was the incomplete address) in the last few days. But yet it couldn’t cancel my order at my request and let me spend another $100. I spent well over 90 minutes on hold with AT&T in four separate calls. I never spoke to someone who was fluent in English. This really hindered our interactions. I surely don’t blame the customer service representatives. They’re heavily scripted, and the systems they have don’t give them the information they need. Online chat for customer service is great if you can really solve problems. But if you’re not going to be able to do account transactions, don’t ask for personal identifying information that gives the impression that you can help. Couldn’t AT&T have sent me a text message when my order was cancelled? I get texts from the company for other reasons. Wouldn’t that have speeded the process in this case? I could have called back right away and gotten the issue resolved. 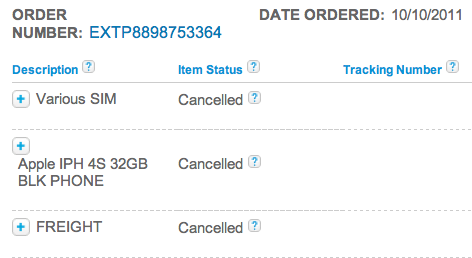 I’m not under any illusion that I have punished AT&T by ordering directly from Apple. That isn’t my intent in this post, either. I know that what AT&T really wants is the two-year contract extension. That’s where the company makes its money, not in the phone sales. So this isn’t a call to Occupy AT&T. It’s meant as constructive feedback. I like being able to talk and surf simultaneously on my iPhone. I would rather not switch in two years when my contract is up. I hope AT&T improves. One of the reasons for not switching to Verizon or Sprint was to avoid the hassle of making the change and porting my phone number. After 90+ minutes on hold with customer service, sticking with AT&T was not the hassle-free choice. So now the Apple store tells me I should expect my new iPhone 4S sometime between Nov. 4-14, or up to a month later than what I would have gotten it if I had ordered directly from Apple in the first place, as my colleague did.